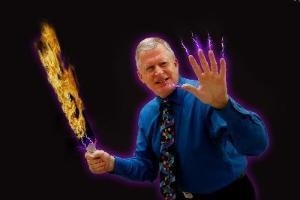 Welcome to the home of Wonders of Science and the "Million Volt Man" programs. DR. DEAN ORTNER has had a career in science second to none. He has presented science demonstrations for the Congress, for Generals at the Pentagon, at the Olympics, and at schools, colleges, and military bases throughout the country. Formerly of Moody’s Sermons From Science, Dr. Ortner has a quick and witty approach to the wonders of science that will spark your interest in new ways. Dean shares the gospel through use of the Wonders of Science program year-round..
After many, many requests over the past 45 years for a DVD set of Wonders of Science we received foundation funding to record, edit and produce the full eight hour, four DVD multi-evening series. We will continue to offer the full eight hour, four DVD set at its introductory price this year: five sets for $100 includes shipping (Christmas gifts? ), or $20 each + $4.95 shipping and handling. Make checks payable to Wonders of Science and mail to Wonders of Science at 6401 Glengarry Avenue, Whittier, CA 90606-1513. Click Here to print out a promotional brochure and learn what Wonders of Science can bring to your organization. 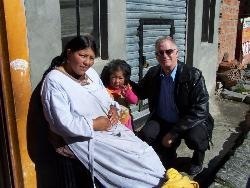 Click on the links below to see some photo galleries of Dean's ministry trip to Bolivia. Dean received the Outstanding Civil Service Medal for his work at the Pentagon. His medal is #032 which means that there have only been 32 medals awarded since the first one that was given by George Washington. He has also received the City of Whittier Mayor's Award in recognition of the medal. Below are some interactive comic tracts that you can share with friends and family. To view another comic, click on the "Choose New Comic" button located at the bottom of the comic after you load the one below. You can choose from 5 comics to read.